An entity in Atlanta posing as a human rights organization has been scamming people overseas. Federal and state regulators are setting up alarms, but they admit that this effort is cleverly constructed to lure the unsuspecting non-English speaker. When you read beyond the headlines of how much charitable giving occurred last year, you’ll find the economic backstory pretty alarming. Can you say “plutocracy”? Today, the Pennsylvania Supreme Court hears arguments regarding the state’s congressional districting map. The case’s importance prompted the Pittsburgh Foundation to file a “friend of the court” brief for the first time in its 73-year history and in a break with standard community foundation practice. To address the need for new textbooks, “smart boards,” and other equipment, foundations are being formed to serve specific schools or school districts. Ohio’s Forest Hills is one such district. As a result of nonprofit health insurers and some hospitals being sold to for-profits over past decades, health legacy foundations, today with $27.5 billion in assets, have become important players in addressing the economic, environmental and social drivers of poor health outcomes. The forthcoming launch of NerdKind expands technology options for nonprofits while giving technologists the chance to match their skills with nonprofits needing their help. 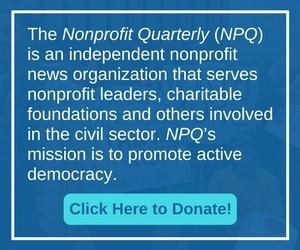 The virtual doors are now open on one of the nonprofit sector’s boldest, most timely, and most badly needed projects—a tool for rating the experience of grant-seekers at the nation’s foundations.